Skillet cake is a classic Southern dessert that’s remarkably tasty and very easy-to-make. 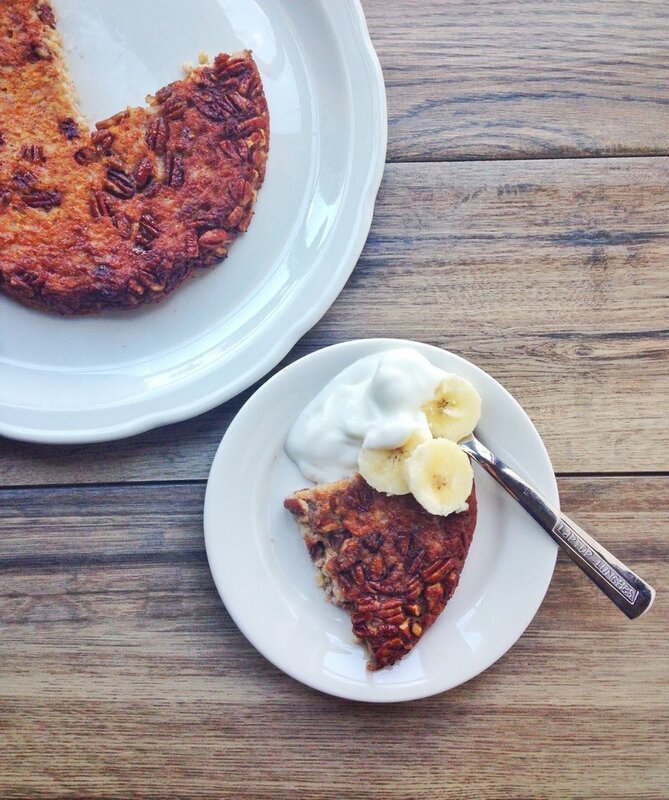 If you’re considering making a skillet cake, then try our recipe for banana pecan skillet cake. The recipe makes for three servings, and it features plenty of deliciously rich pecans, maple syrup, Greek yogurt and fresh bananas too. We suggest pairing this with some fresh coffee—you’ll find that the coffee helps to bring out the flavors of the pecans, making for a truly enjoyable dining experience. If you happen to know someone who loves pecans, then consider sharing the recipe with them on Facebook, Pinterest, Instagram and Twitter. If you’ve never tried skillet cake before, then you’re in for a fun surprise—it’s a really flavorful dessert, and we’re confident that you and your whole family will fall in love with our recipe. To get started making our skillet cake, you’ll need some Good Food Made Simple Steel-Cut oats, a tablespoon of sugar, a ripe banana, a teaspoon of ground cinnamon, a large egg, a ½ teaspoon of baking powder, a tablespoon of Cabot Butter, chopped pecans, maple syrup, Cabot Greek Yogurt and some sliced bananas. Preheat your oven to 375 degrees Fahrenheit, and then combine the sugar, oats, cinnamon, banana, eggs and baking powder into a bowl. Then heat your butter in a cast iron or oven-approved skillet, and then add some pecans to the skillet. After you do that, transfer your batter to the heated skillet, coating the pecans evenly. Place the skillet with the mixture into the oven for 30 minutes. After a half hour has passed, remove your skillet and let it cool for 10 minutes. Once cooled, portion out the cake, and top each serving with some maple syrup, sliced bananas and a dollop of Cabot Greek Yogurt. We hope you enjoyed our recipe for skillet cake. If you’d like to try another dish that can be prepared using a skillet, then you might enjoy our recipe for Canadian Bacon and Asparagus Quiche. This dish is ideal for both lunch and dinner, and it’s rich and savory too—honestly, it’s an easy one to get addicted to! Cabot is a cooperative of 800 farm families, and we’ve been making award-winning dairy products for generations. From sour creams to aged cheddar cheeses, we take a great deal of pride in ensuring that all our dairy items are made using the finest ingredients. We want to make sure that our skillet cake recipe is up to our high standards—after trying the recipe, please make sure to rate and review the dish. We can’t wait to hear back from you! COMBINE oats, sugar (if desired), banana, cinnamon, egg, and baking powder in a small bowl. HEAT butter in a small cast iron or oven-proof skillet over medium heat; arrange pecans in bottom of pan. Spread batter evenly over pecans. TRANSFER skillet to oven and bake at 375°F for 30 minutes. Remove from oven and let stand at least 10 minutes. To serve, top evenly with maple syrup and serve with sliced banana and Greek-Style yogurt. This was so delicious!! It came out perfect and was a huge hit at my family gathering!